1. Heat the milk and butter over low heat until the butter is just melted and the temperature of the mixture is between 100°F (38°C) and 105°F (40°C). 2. Combine the milk mixture and yeast in a medium bowl or standing mixer and mix on low for 30 seconds. Add 1/3 of the flour, all of the sugar, and a pinch of salt. Mix 15 seconds, until just combined. Add another 1/3 of the flour and the egg and mix another 15 seconds. Add the remaining flour and mix until the mixture begins to come away from the sides of the bowl, roughly 30 seconds. Remove the bowl from the mixer, cover with plastic wrap, and let dough rise until doubled in size, about 1 hour. 3. Place the dough onto a lightly dusted work surface and roll until 1/2-inch thick. Using a 1 1/2-inch round cutter, cut dough into 48 round doughnut holes. Pour oil into a heavy-bottomed saucepan to a depth of 3 inches. Heat to 375°F (190°C). Fry doughnuts in batches until golden brown, about 45 seconds per side. Drain on paper towels. Mix 1/2 cup boiling water gradually to one cup confectioner's sugar. 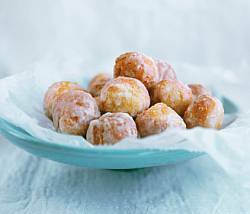 Dip doughnut holes deep into glaze. To make a traditional doughnut shape, use a 3-inch round cutter to create the doughnut and 3/4-inch cutter to cut out the doughnut hole. Makes 48 doughnut holes or 1 1/2 dozen 3-inch doughnuts. I pleased my whole family with these delicious donuts. They're very easy to make and they certainly won't disappoint you. I added a bit of vanilla, and then I made a banana version by just adding some mashed banana and then rolled the balls in cinnamon and sugar.. delish! Once again ..THANK YOU DIANA! yum yum yum! the only problem is taht they are bite sized so you could eat the whole lot without even noticing! WASTED TIME AND MONEY, DIDN'T WORK. FOLLOWED ALL THE STEPS. THIS DID NOT WORK. ITS A WASTE OF MONEY AND TASTED ABSOLUTELY DISGUSTING. Had already made donut holes, just wanted the glaze. The boiling water is a good idea, but it was altogether WAY too thin - needed about 1 1/2 cups confectioners' sugar to get a "glaze" on the holes. Also added a little vanilla, and a pinch of salt.